Many people have asked “Kevin, what is it exactly that you do? What is a video producer?” Well this article from Jenell Talley at Mediabistro is a perfect explanation. 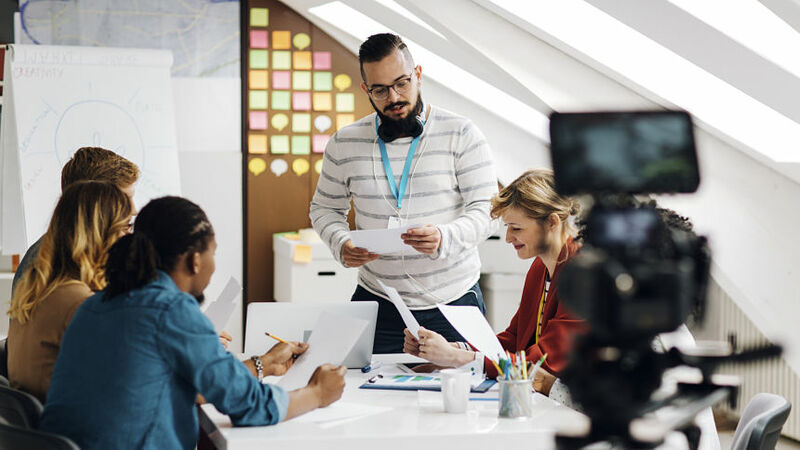 Whether they work on commercials, news spots, corporate communications or something else entirely, video producers have one thing in common: They make things happen. They’re also in luck, as there are usually plenty of video producer jobs available on our job board. Video producers call the shots, and a lot rests on their shoulders, so the easily daunted need not apply. But if you’re looking for a job to use your creativity, and business and people skills, this one’s for you. What exactly does a video producer do? This creative problem solver manages all elements of a video’s pre-production, production and post-production process, including planning, scheduling and editing. The producer budgets and actualizes expenses; secures locations, required permits and studio time; establishes on-set safety precautions; and conducts interviews and helps direct on-screen talent. He also hires and schedules key staff (e.g., camera operators, makeup artists, sound people, grips, editors, graphic artists). Producers also have a hand in audio, graphics, visual effects and versioning/adaptation for different markets, and they may even write voiceover scripts, says George Spyros, owner of Big City Pictures, a production company in New York and creator of video app Filmakr. In addition to ensuring content, length, tone and style requirements are satisfied for each project, a video producer must run point, facilitating the exchange of information between the client and members of the production team. It’s the producer’s job to make sure projects are held to a high creative standard, delivered on time and stay within budget, so the buck stops with them—literally and figuratively. Check out open video producer jobs and other marketing jobs on Mediabistro’s job board. Time management and organizational skills are extremely important in keeping projects running smoothly and not overspending, says Tania Sethi, executive producer at Hogarth Worldwide, a production agency in New York. Flexibility and compromise are also important. “Things are always changing, often at the last moment, so while the producer has [mapped out] everything, you can’t remain rigid” if something throws a monkey wrench in the plan, says Spyros. Interpersonal skills are necessary as well, as video production is a collaborative effort. “The producer must be able to understand the motives of the players and work to satisfy everyone’s needs, often sacrificing his own in the process,” he adds. Creative problem-solving skills are also invaluable in this line of work. When the sun goes down and the lighting is suddenly different, you still have figure out a way to get your last daytime shot. And you don’t have all day (excuse the pun) to decide because time is money, and every second counts. Who is a video producer’s boss? In a publishing company, a video producer may report to an editor, just as a writer would. For agencies, television or film, they often report to an executive producer, production director or head of production. How can you break into this field? A degree in broadcast production, film or communications is helpful, advises Spyros, but an internship or job in primary or post-production will make entry easier.